The Swiss HPC community hpc-ch and CSCS invite you to visit the “Swiss House of HPC” at SC15 in Austing at booth 396, where you can meet Swiss HPC specialists and scientists, and get the latest news about HPC and science in Switzerland, together with some Swiss coffee and chocolate. 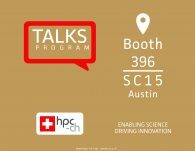 Among the novelties, every hour you will have the opportunity to follow a talk that show the excellence of Switzerland in HPC and world-class research. By participating at one of the numerous talks you will receive a nice and original gift! The goal of hpc-ch is to support and foster the knowledge exchange between providers of HPC systems at Swiss universities. With hpc-ch we will be able to lnow the offering and organization of other Swiss HPC providers, to exchange best practices, coordinate activities an discuss developments in HPC. We will show how to create a community to support and foster the knowledge exchange between providers of HPC systems in a country. He will do this with the help of the case study of a ground of professionals in HPC which decided to create a HPC community in Switzerland in order to know the offering and organization of Swiss HPC providers, exchange best practices, co-ordinate activities and discuss developments in HPC. Measuring and reporting performance of parallel computers constitutes the basis for scientific advancement of high-performance computing (HPC). Most scientific reports show performance improvements of new techniques and are thus obliged to ensure reproducibility or at least interpretability. Our investigation of a stratified sample of 120 papers across three top conferences in the field shows that the state of the practice is not sufficient. For example, it is often unclear if reported improvements are in the noise or observed by chance. In addition to distilling best practices from existing work, we propose statistically sound analysis and reporting techniques and simple guidelines for experimental design in parallel computing. We aim to improve the standards of reporting research results and initiate a discussion in the HPC field. A wide adoption of this minimal set of rules will lead to better reproducibility and interpretability of performance results and improve the scientific culture around HPC. The Swiss National Supercomputing Centre is run as User Lab and promotes and encourages top-notch research. Consequently, CSCS operates cutting-edge computer systems as an essential service facility for Swiss researchers. These computers aid scientists with diverse issues and requirements. This talk tries to give an overview of the services offered at CSCS, the allocation schemes, as well as who can apply, how and when. We will also present the PASC16 Conference a leading event for researchers in computational science and high-performance computing. From 2016, the PASC Conference will be co-sponsored by the Association for Computing Machinery’s (ACM) Special Interest Group on High Performance Computing (SIGHPC). We present a scalable implementation of the Linearized Augmented Plane Wave method for distributed memory systems, which relies on an efficient distributed, block-cyclic setup of the Hamiltonian and overlap matrices and allows us to turn around highly accurate 1000+ atom all-electron quantum materials simulations on clusters with a few hundred nodes. The implementation runs efficiently on standard multi-core CPU nodes, as well as hybrid CPU-GPU nodes. Key for the latter is a novel algorithm to solve the generalized eigenvalue problem for dense, complex Hermitian matrices on distributed hybrid CPU-GPU systems. Performance test for Li-intercalated CoO$_2$ supercells containing 1501 atoms demonstrate that high-accuracy, transferable quantum simulations can now be used in throughput materials search problems. A systematic comparison between our new hybrid solver and the ELPA2 library shows that the hybrid CPU-GPU architecture is considerably more energy efficient than traditional multi-core CPU only systems for such complex applications. We show the GPU accelerated weather simulation code COSMO running in live on the Meteoswiss system at CSCS with immediate visualization of the ongoing simulation. The simulation runs about 20x faster than real time with grid cells of 1km. The simulation makes it possible to modify the surface temperature and the wind direction in areas of the simulation domain. The capabilities of CP2K, a density-functional theory package and OMEN, a nano-device simulator, are combined to study transport phenomena from first-principles in unprecedentedly large nanostructures. Based on the Hamiltonian and overlap matrices generated by CP2K for a given system, OMEN solves the Schrödinger equation with open boundary conditions (OBCs) for all possible electron momenta and energies. To accelerate this core operation a robust algorithm called SplitSolve has been developed. It allows to simultaneously treat the OBCs on CPUs and the Schr”odinger equation on GPUs, taking advantage of hybrid nodes. Our key achievements on the Cray-XK7 Titan are (i) a reduction in time-to-solution by more than one order of magnitude as compared to standard methods, enabling the simulation of structures with more than 50000 atoms, (ii) a parallel efficiency of 97% when scaling from 756 up to 18564 nodes, and (iii) a sustained performance of 14.1 DP-PFlop/s. At the Swiss National Supercomputing Centre (CSCS) in Lugano the new “super weather computer” of the Swiss Federal Office of Meteorology and Climatology MeteoSwiss has started its operation. MeteoSwiss is the first meteorological service which has switched to a new GPU based computer architecture. Thus, the new supercomputer is able to calculate weather models with a resolution twice as high more efficiently and quicker than before. We present simulations of blood and cancer cell separation in complex microfluidic channels with subcellular resolution, demonstrating unprecedented time to solution and performing at 42% of the nominal 39.4 Peta-instructions/s on the 18’688 nodes of the Titan supercomputer. These simulations outperform by one to three orders of magnitude the current state-of-the-art in terms of numbers of cells and computational elements. We demonstrate an improvement of up to 30X over competing state-of-the-art solvers, thus setting the frontier of particle based simulations. The present in silico lab-on-a-chip provides submicron resolution while accessing time scales relevant to engineering designs. The simulation setup follows the realism of the conditions and the geometric complexity of microfluidic experiments, and our results confirm the experimental findings. These simulations redefine the role of computational science for the development of microfluidic devices – a technology that is becoming as important to medicine as integrated circuits have been to computers.